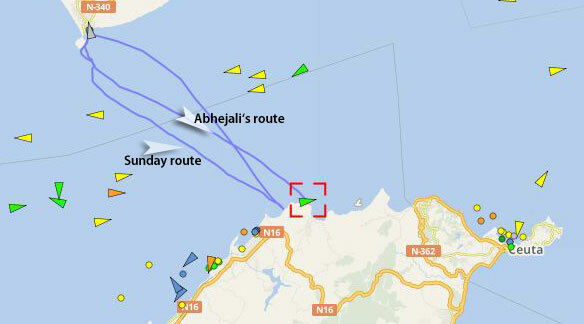 Abhejali – our next team member to “conquer” the Strait of Gibraltar! 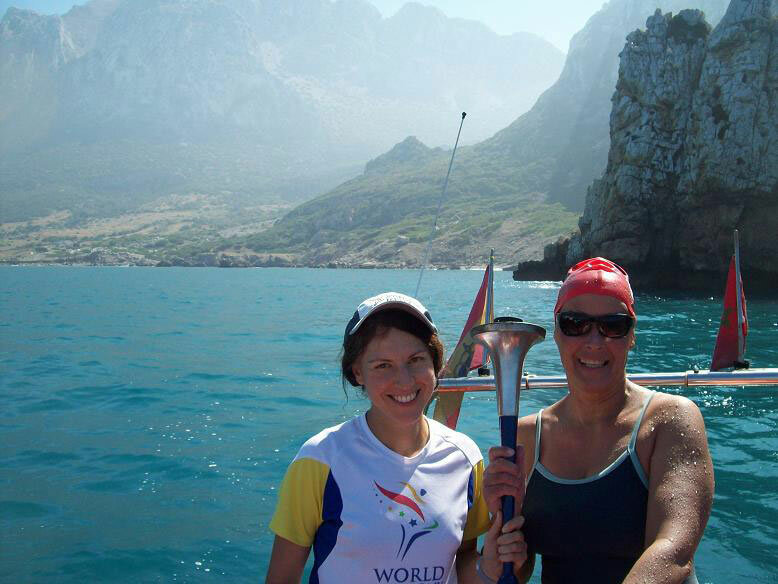 On Monday, Sept. 16th, 2013, Abhejali Bernadova from Zlin, Czech Republic, fastest swimmer in our international English Channel relay 2009, English Channel solo swimmer 2011 and Manhattan Island Finisher 2012, became the 2nd Sri Chinmoy Marathon Team member to conquer the Strait of Gibraltar – in a very good 4 hours 35 minutes. Which made her the 3rd Czech Strait woman to do so – and the fastest of them! 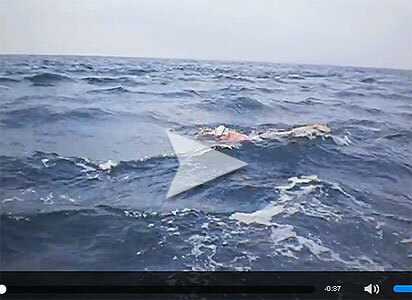 Conditions were less than ideal, windforce 3-4 most of the way – the AGNEC certificate says windforce 4 – and on the video the waves and whitecaps of the first hours are quite impressive compared to my own swim in 2012. Luckily everyone had taken seasickness pills – so seasickness only became a problem when they went dolphin watching (again) a few days later. Sunday, when a leftover team from the week before got to swim, was still sunny and calm (the photo at the top was taken on Sunday), but on Monday, on swim day, even though only windforce 2 was predicted, the Straits showed a different face. 1. She got to swim at all (it is not rare for swimmers to come and not get a shot at all due to the weather). 2. She had an early morning start at 8 a.m, and the current – although unfavourable at the start – was not very strong near Africa. On the way back the pilot measured the current 5 km off Tarifa – and it had become basically unswimmable! 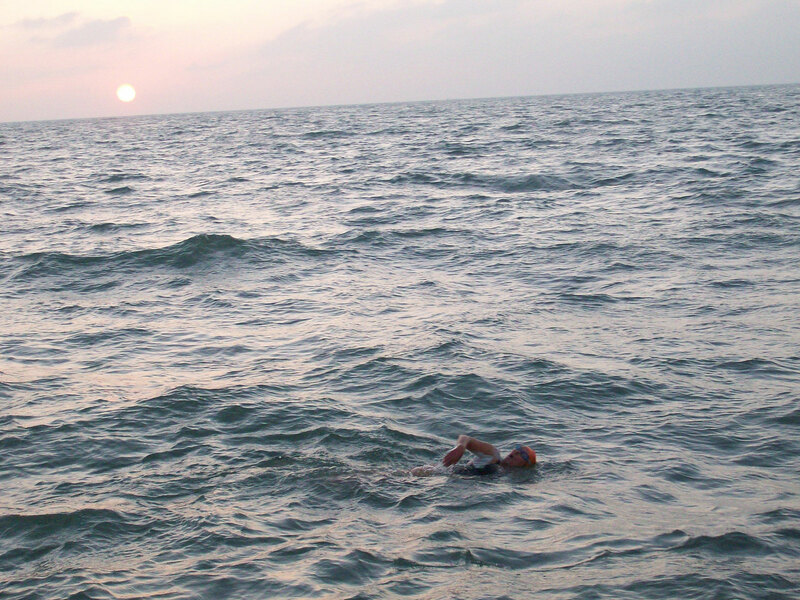 In the first hour she only swam 2 km due to the strong currents (almost full moon), but after 2 hours she was told in 20 min. she would be half way – so she was able to pick up speed. 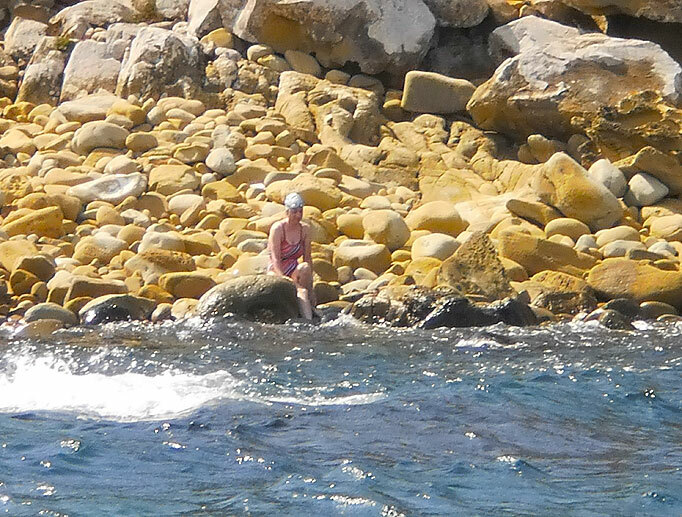 One shoulder soon started to hurt from swimming in the waves – which she had not been able to practice in training – and pain killers did not help very much. “It was not easy, but it was very beautiful,” Abhejali said after her swim. What will be next?, I asked her. Catalina, Cook Straits – or any other of the 7 Oceans swims? Maybe later, she says. 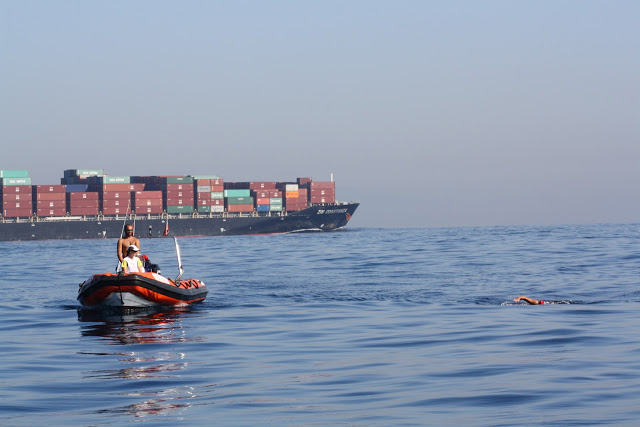 She would love to swim from Europe to Asia (the Bosporus – an even shorter swim). “But now I’d also love to go back to running a little”, she says – a 24 hour and 100 km champion in her country, and lover and long time co-organizer of the World Harmony/Peace Run. “Prepare for the worst – hope for the best.” This English Channel motto definitely also applies to swimming the Strait of Gibraltar. It can be extremely easy – only half a Zurich lake marathon swim! – and it can be “the hardest swim of my life” (Armin Wunder). 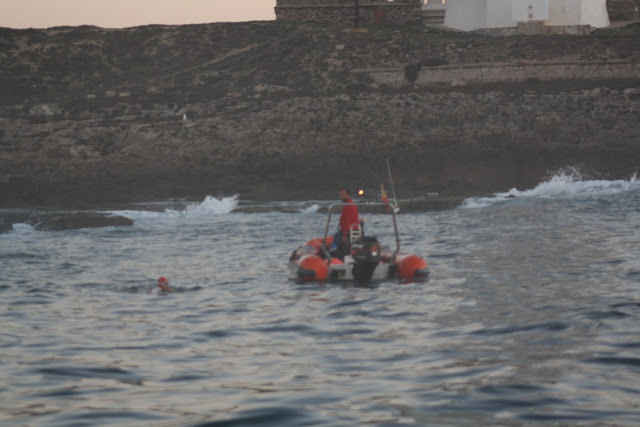 Pat Gallant-Charette (EC in 15:57) had swum the Strait o Gibraltar at age 59 in only 3 hours 28, supported by some amazing currents as Rafael explained, whereas a fellow countryman who swam the English Channel in 11 hours 20 had to battle it out for 7 hours 30 min., due to a strong current that kept him swimming in one place for 2 hours. 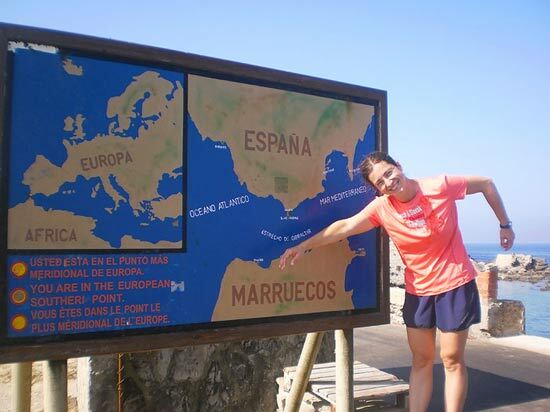 When I was invited to participate in the Moroccan part of the World Harmony Run in 2008, I wondered “Why not swim from Spain (Europe) to Africa?”, and another dream was born. 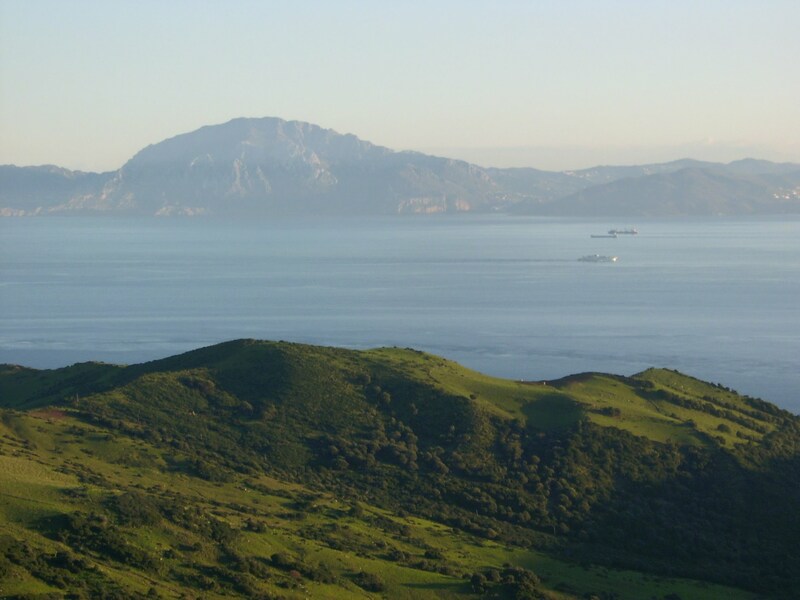 I soon realised, however, that it is not so easy and inexpensive as one might think, even if the distance between the two continents at the narrowest point of the Strait of Gibraltar is only 14,4 km. Just to get there by plane, train and bus (or rented car), then having to allow for the possibility of a bad weather period like at the English Channel, and even the possibility of being stopped by fog, wind picking up or erratic strong currents that can give a hard time even to fast swimmers. Boat and registration alone are 1700 €uro (for more info see ACNEC). But it turned out to be a blessing. We experienced warm air (19-24°C), warm water (20°C most of the way, with only a few cold patches and currents nearer to Africa), quite a few calm days – and appartment prices are lower after the main season. Tarifa, where swimmers will stay to wait for their swim, is dubbed the world’s kite surfing capital and is much more peaceful now – the summer craze is over, and training swims at the endless kite surfers beach Playa los Lances, with beautiful clear water and softly rolling waves, is less dangerous. 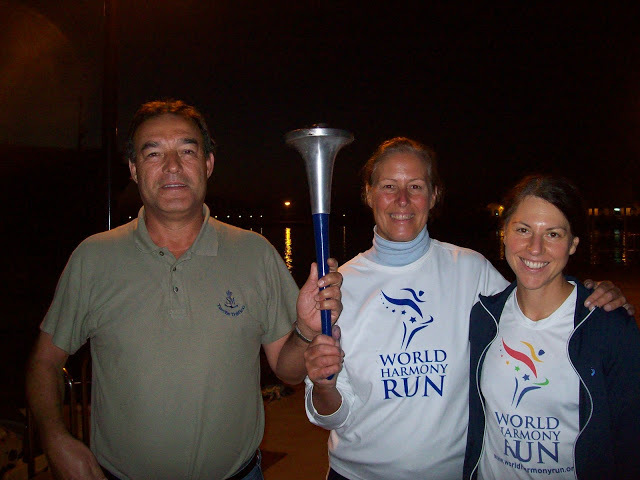 I was happy to be able to dedicate the swim to the 25th anniversary of the World Harmony Run – and almost everyone got the opportunity to hold the World Harmony Run torch! Booked for Oct 7-15th I arrived the night of the 4th, briefly talked to Rafael, the president of ACNEG the next morning, to meet for detailed information on Sunday evening (the 7th) , with a view to swimming on Tuesday or Wednesday the 9th or 10th around 8:30 a.m. “You are a slower swimmer,” he said, “you need the right combination of wind and currents”. Wednesday would be best with half an hour more tidal support. This sounded quite reassuring. I had come with a cold from a final 3 hour cold swim at home, feeling quite weak, and hoped to be able to get well and acclimatise in time. Albena, my helper from Edinburg, was due Saturday (6th) late at night. Shortly before she arrived, a text message from Rafael came: “If tomorrow the weather is good we’ll try to cross. I’ll inform you by morning.” O no, not this experience again! I was still sick, unprepared and uninformed about any details, and stores were closed on Sunday. I called Rafael to learn a possible start would be at 1 p.m. I realised that would force me to stop if I needed longer than 7 hours – since the sun was setting at 8 p.m. and there is no night swimming allowed in the Straits. Also wind and currents did not look too good on the internet. I sent a text message to Rafael that I wanted a fair chance. My inner voice said: no swim for me on Sunday. Even if there was mist predicted for Tuesday and fog for Wednesday morning. Luckily, there was no call on Sunday morning, so no discussion was needed. We had time for a proper briefing with everyone later in the day, more shopping on Monday, rest, food and two more training swims in the colder coastal water, before the final call came – for Tuesday. Ginger tea and Paracetamol helped me once again, and on Oct. 9th, at 8:30 a.m., I felt o.k., mas o menos. It was quite misty – and at the starting point at Tarifa island, ready to go, there was a discussion between the two pilots – Christina on Columbia 2 and Fernando on the small craft (who had swam the Straits 5 times, fast!) – for a few minutes whether it would be safe to give it a try or not. Albena obviously asked the right questions to help with the decision – according to the forecast the mist would lift soon and the sun was already visible in the East. So off we went. 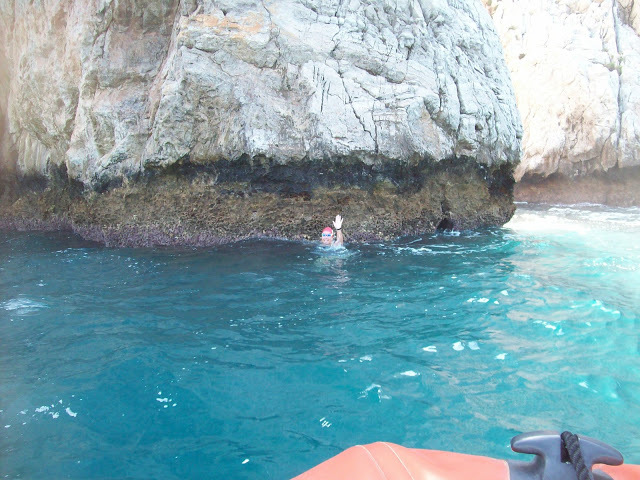 I had to swim towards the rocks, but the swells were powerful – so we started a few meters away. I swam into a beautiful calm day. Soon the rays of the sun lit up the dusky water below me. Apart from the schools of fish at the rocks at the start I did not see much marine life: one single fish, one lonley jelly, and some whitish marshmallow-like things speeding under me in the currents at the end. Albena saw a few dolphins in the distance at the start and a flying fish at the end. 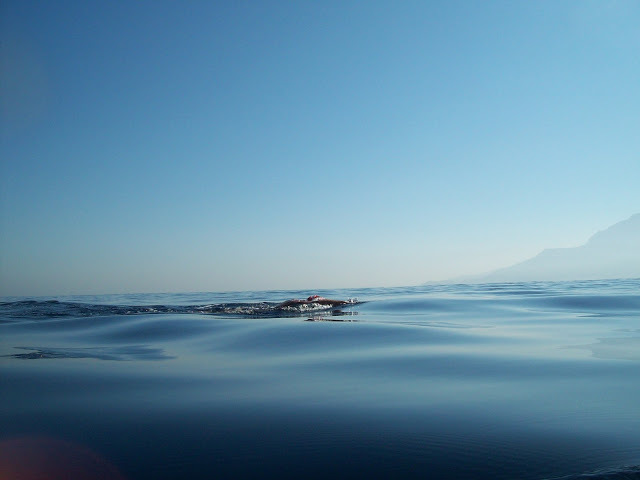 In the Straits, the bigger boat is always guiding you, going in front (which I like – but to be sure the boat stays so far away that it is definitely not assisting the swimmer!!! ), and the smaller craft mostly stays beside you with your helper and food. Feeding in calm water is easily done by hand – we still used rope to retrieve the cup or bottle. My feeding plan was: first feed after 45 min., then 40, 35 and 30 min. intervals. Mainly 2 dl hot ginger tea or Bengal Spice tea mixed with maxim (every 30 min) plus fruit sugar (on the hour), in between an additional piece of banana, canned peach, half a tiger sweet or Chia seeds (endurance runners’ secret). We had brought loads, but hardly needed anything – just as on the Zurich lake. 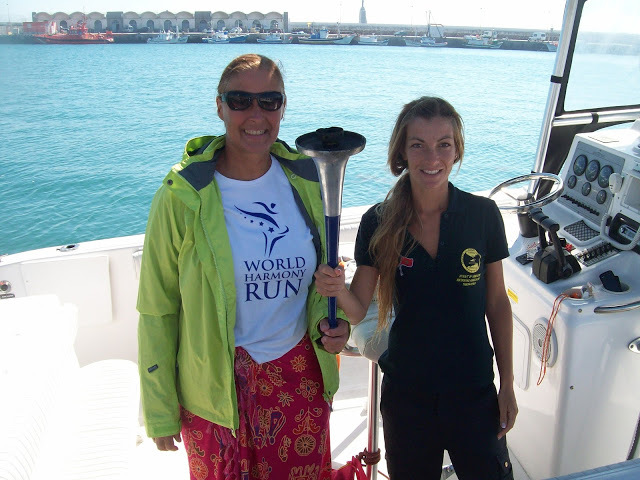 Back on the boat, we held the torch of the World Harmony Run together, which had been present also at the IMSHOF Ceremony in Long Beach and in my last EC swim and relay. Oceans and waterways are connecting people – an idea embodied in the torch. And one of my favourite mantras in the water, along with special songs or aphorisms, is “peace”, in the rhythm of my stroke. I had intended to dedicate the swim also to Tegla Louroupe`s Peace Academy – but fundraising is not my thing. I was thinking of the kids during my swim – and next year, with the Harmony Run bigger in Africa, we will go there again, and we have been supporting the school and other projects for quite some time and will continue to do so. 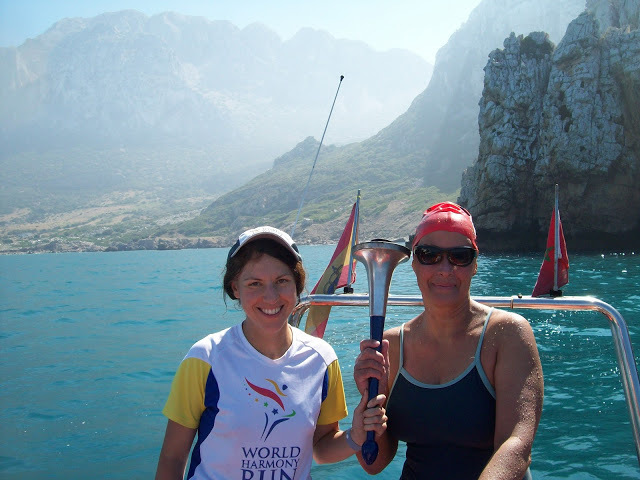 Albena was a great helper, and she loved the whole experience, even getting into the water with me for a few strokes. The second swimmer on my tide was less lucky. The following day was calm, but thick fog prevented any swim, after that the winds picked up. When he finally started, a strong tidal westward current around Tarifa island made the skipper change the start to the rocks east of the harbour (also more northern) – and after 3 hours he was pushed so far to the east that there was no chance of landing any more. Conclusion: prepare for the worst, even a no-swim – and pray for a great day! And take the whole stay in Tarifa as a holiday – if the swim works, great, if not (only 10 % failure rate I am told), at least you got so see nice places (go whale and dolphin watching, visit Tanger etc.) and meet nice people, hopefully! As a training swim for the Channel, lake Windermere or the Zurich lake may be more helpful. But “Swimming to Africa” has its own special magic. Back home in Heidelberg now, part of me and my heart is still there in Tarifa, feeling the sand under my feet, gliding through the clear and powerful water, or marvelling at the glittering lights on the African coast at night, looking ever so close from the rooftop terrace of our appartment. By the way, registration for the Zurich Lake Int. Self-Transcendence Marathon Swim just started! 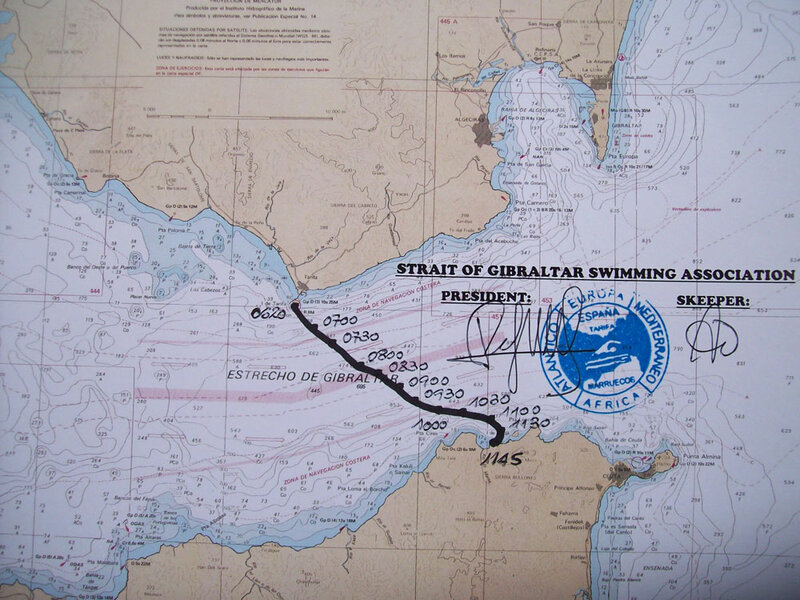 For more info on Swimming the Strait of Gibraltar see the website of ACNEC. And this is where we stayed, a very nice and affordable place, with a beautiful view (in the main season probably quite noisy with lots of young kite surfers): Residential Luna. 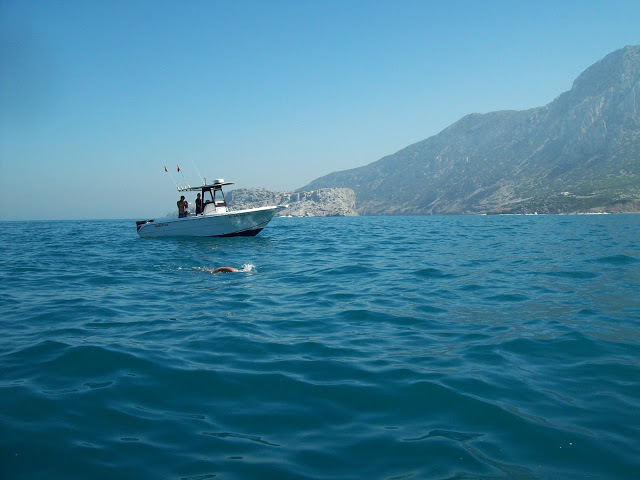 Of course, swimming the Gibraltar Straits is special – bridging two continents right where the Mediterranean and the Atlantic Ocean meet, where conditions can be quite unpredictable and even much faster swimmers have ended up being stopped by currents or fog or swept out far away from firm land. But reaching Africa after “only” 5 hours 25 min. in a way just felt like a longer training swim – basicall only half a Zurich lake! 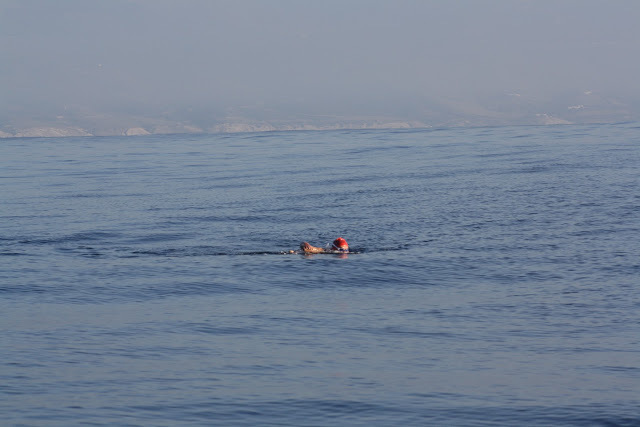 2 km off the coast they had even told me we might make it under 5 hours – “only half an hour to go” if I sped up, and I had to smile – I have heard that a couple of times on my English Channel swims! The feeling of joy, calmness and peace after the swim, however, was more intense then after a regular training swim! I touched Africa at Marsa Point – a steep rock in Morocco at the foot of Jebel Musa. They had wanted to land us at Perejil island, a little closer, but when Albena heard it belongs to Spain – and was just an island – she protested. She was sure I “really” wanted to reach Africa! 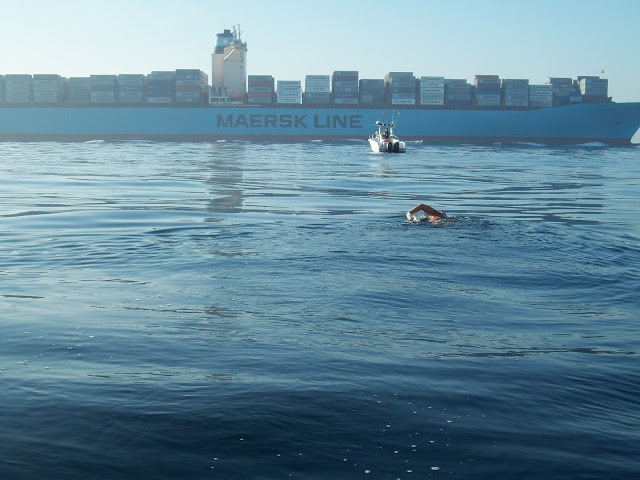 So I had to swim a few meters more – which I am actually grateful for. For more photos or a slideshow please click here. Like with my Channel-Triathlon of 2010 and our English Channel Relay of 2009, we had the World Harmony Run torch on board again and I wanted to dedicate the swim to my teacher and inspirer Sri Chinmoy and his vision of international friendship embodied by the World Harmony Run. For more information about Gibraltar Strait Swimming and the organisation behind it pls. visit the website of ACNEC.